Groovy! A Review of the first episode of Ash Vs. Evil Dead! One of my formative experiences in life may have been my exposure to the Evil Dead movies. Oddly enough, it came through the third movie, Army of Darkness, which lead me back to the original and eventually Evil Dead 2 (the best of all three). 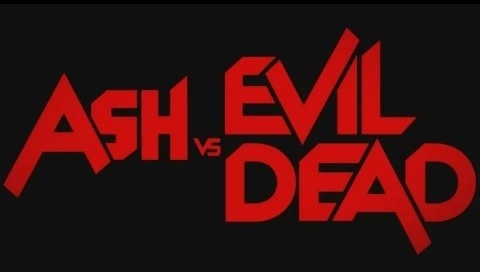 I even enjoyed the recent remake (maybe connected to the original based on that little teaser in the end credits), so when hearing of a new cable series on Starz that would follow the events of the original trilogy, Ash vs. Evil Dead, I had reservations. Oh, not that I thoroughly doubted this whole endeavor, especially knowing Bruce Campbell and Sam Raimi were on board, but a series? Really? Turns out my fears were unfounded. Taking place almost in real time after the events of Army of Darkness, we stumble upon Ashley Williams (the titular “Ash” played by Campbell) still working in retail, and still the cheesy cocky guy he was back then, if a few pounds heavier. The years have been relatively quiet for Ash, but the brief appearance of the Deadites that plagued him back then forces him to figure out how they have returned since he is the only one who has that cursed Book of the Dead. The answer to that is a unsurprisingly dopey mistake on Ash’s part that has caused the evil Deadites to return to our world. So he’s reluctantly forced to find a way to stop the Deadite terror yet again, and of course that involves a shotgun and a chainsaw hand. The pilot, directed by Raimi, is pretty effective in throwing us back into the world of Evil Dead, while setting up the new characters around it. Among them are his fellow employees Pablo (Ray Santiago) and Kelly (Dana DeLorenzo), who get swept up in the lunacy that follows Ash. On the tertiary end (at least in this first episode) is suspended cop Amanda (Jill Marie Jones) who had her own run in with Deadite terror and a very brief appearance here from Lucy Lawless as a mysterious character called Ruby. And Campbell is always aces, especially here playing a not quite in shape but still formidable opponent to the undead. Visually, the show keeps nodding to the films, like the return of the ominous “force” that flies on the search of prey, while setting up a tone for the rest of the series. It actually hews more to the sequels than the original movie in regards to tone, instead of going for stone cold terror to playful horror comedy. Raimi is pretty effective of adding some menace to the Deadites when they attack, though, even in one scene where someone’s possessed body is contorted in a truly twisted way, and able to play the humor of another attack which is almost a homage to a classic Twilight Zone episode. A lot of the makeup work is practical stuff (this series certainly earns its TV-MA rating with the gore alone), but if there’s one slight minus to the show is occasionally the CG gore for certain shots gets to be a bit much to believe. That we get ten half-hour episodes, which include this slightly longer pilot, this season (a second season has already been ordered) seems like a sane quality amount of time to spend in this world as a series, lest we risk going into overkill with this premise. We end this episode setting up Ash’s quest to stop the Deadites, and wonder how the characters around him will play into that. 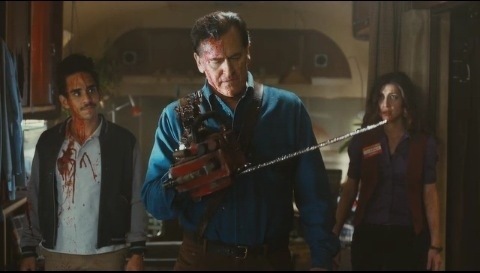 In terms of ribald horror fun, Ash vs. Evil Dead looks like it’ll provide that big time. Of course, now that I have a weekly fix of new Evil Dead for the next few weeks, I can give the DVDs of the first two movies a rest. 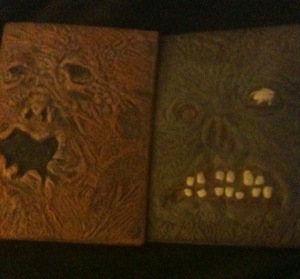 It helps they get to rest in these special editions that look like the Book of the Dead.